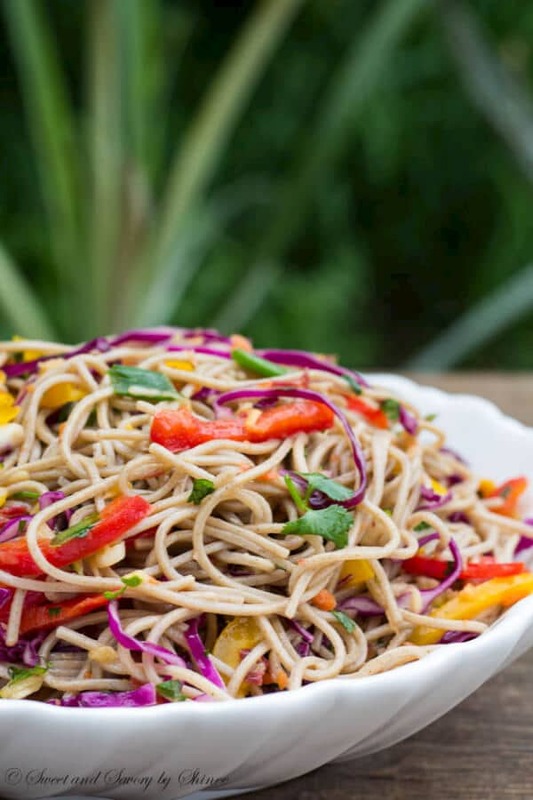 This buckwheat noodle salad bursting with Asian flavors is light, flavorful and healthy side dish for any BBQ dish! I don’t know about you, but I like my summer filled with salads, fresh fruits and lemonade. I crave light and colorful food on blazing hot days. You too? Yeah, summer calls for vibrant colors and fresh flavors. Just look at these beautiful mix of vegetables! 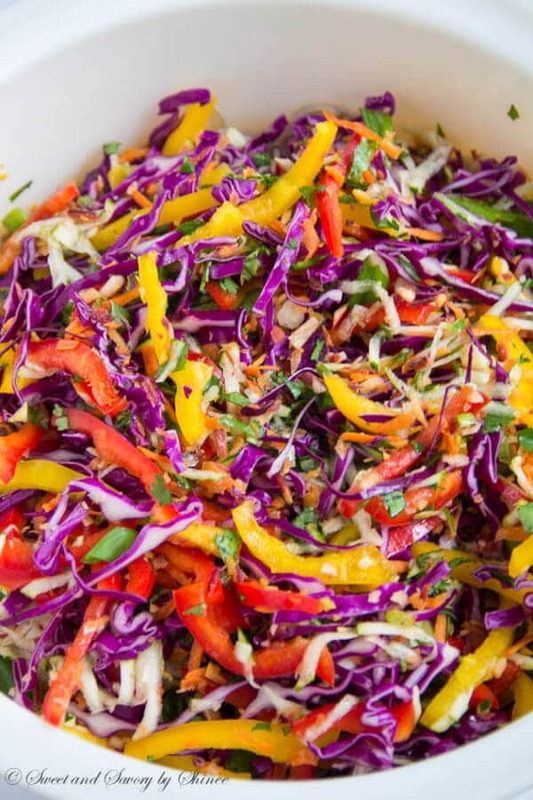 And this salad is all about flavors and colors! Perfect for BBQ, lunch, or even light dinner. Just in case you’re wondering, buckwheat noodles, aka soba noodles, are made of buckwheat flour and very popular in Japan. 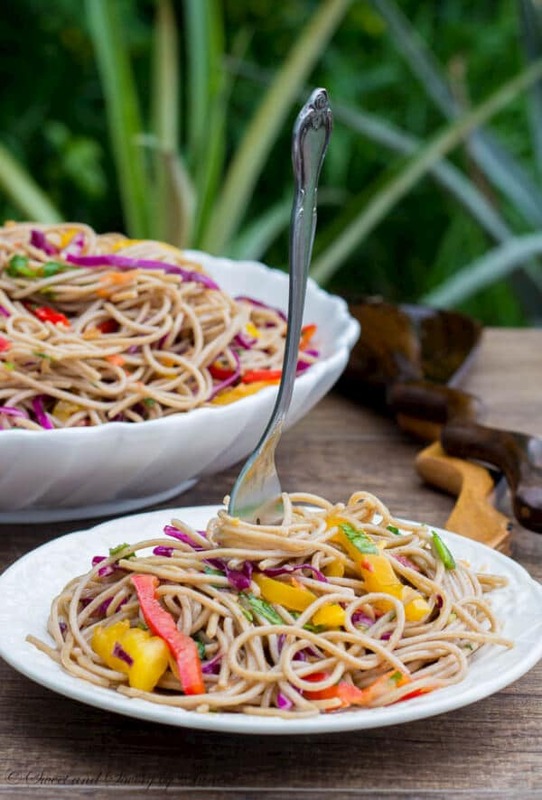 100% buckwheat noodles are naturally gluten-free, but I’ve heard that some buckwheat noodles do contain wheat flour. So just read the labels carefully, if you follow gluten-free diet. 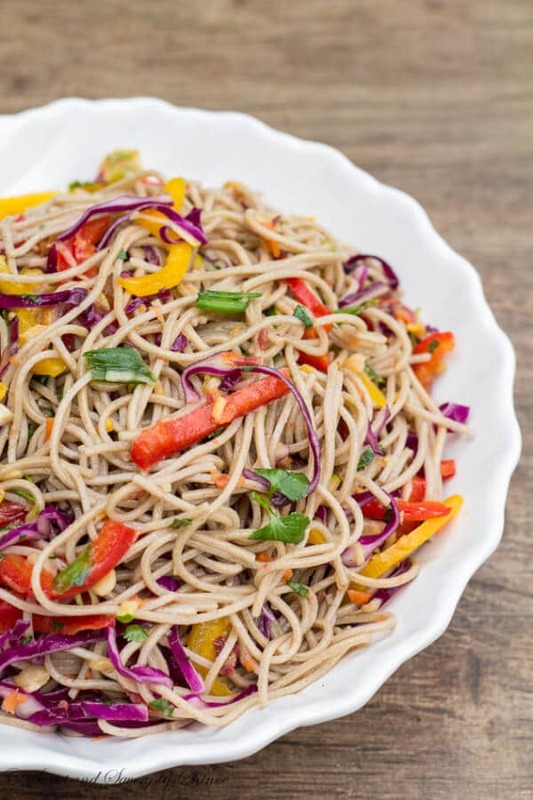 Buckwheat noodles are absolutely delicious with nutty, earthy (not dirt-like!) flavor. My husband, who totally loathes buckwheat groats, loves these noodles! Don’t let the weird greyish color turn you off, they are incredibly flavorful and healthy alternative to regular spaghetti. Next time you’re in Asian market, buy a packet to try! If you’re planning for a potluck, you can prepare the vegetables a day in advance. Almost make-ahead recipe here. And as we are making Asian-flavored salad here, soy sauce and sesame oil are the main flavor ingredients in this salad. I live for sesame oil!! 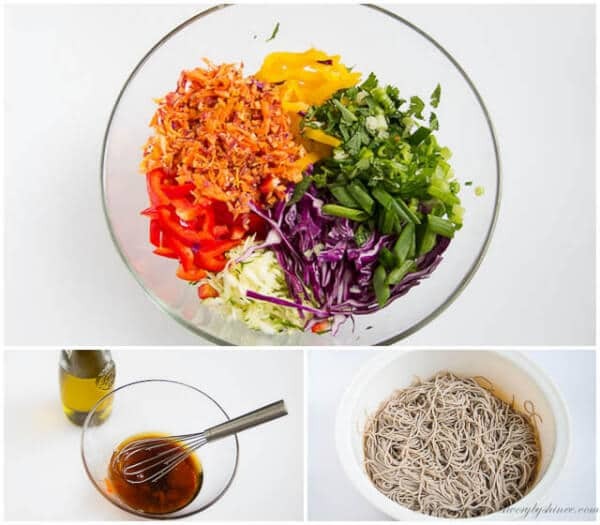 If you like sesame oil, you’ll definitely love this salad. Now, dig in, my friend! Boil the buckwheat noodles according to package directions, for about 6-7 minutes. Drain and rinse under cold water. While the noodles are cooking, prepare the dressing. In a small bowl, whisk together rice vinegar, soy sauce, honey, sriracha, and sugar until sugar is melted. Slowly stir in olive oil. Set aside. In a large bowl, toss all the vegetables until well combined. 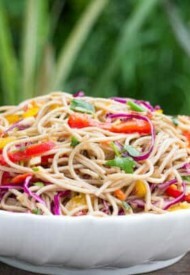 Then toss it with buckwheat noodles and salad dressing.